Herb Caen floats over San Francisco. 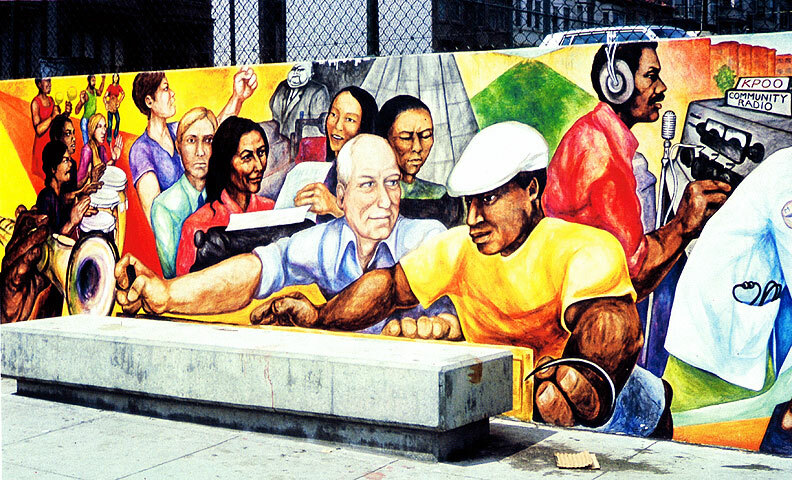 San Francisco has enjoyed a renaissance of public mural painting going back to the early 1970s. During the decades since, many murals have been painted and then later were lost, either due to being buried behind new buildings adjacent to them, or to the destruction of the buildings on which they were painted. 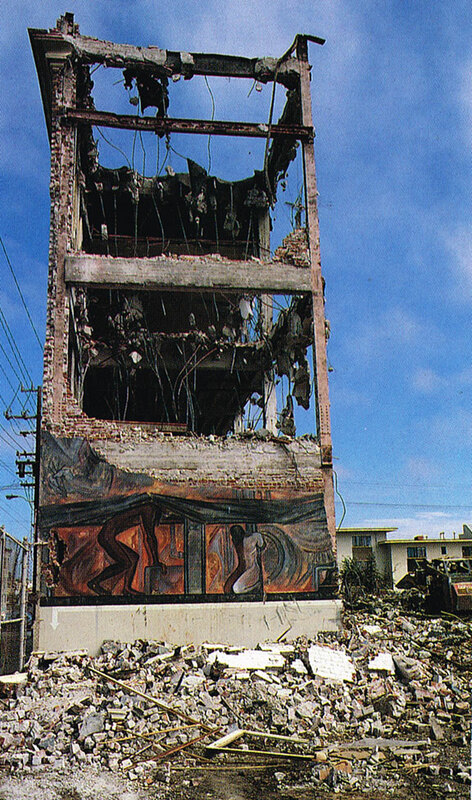 There are some examples of lost murals on other pages in Foundsf.org, such as the story of the Mission Coalition Organization where Michael Rios painted the first mural in the Mission in 1972 and it was later obliterated; the Vietnam War mural on the side of a building on 24th Street where there used to be a parking lot at Bryant and now is hidden behind a new structure; or the much-loved Chuy Campusano mural that once towered over the intersection of 17th and Harrison, but was whitewashed and painted over by the Cort family when they bought the building. Here are some more lost murals, with many more to be documented (and hopefully not too many more to be lost going forward!). 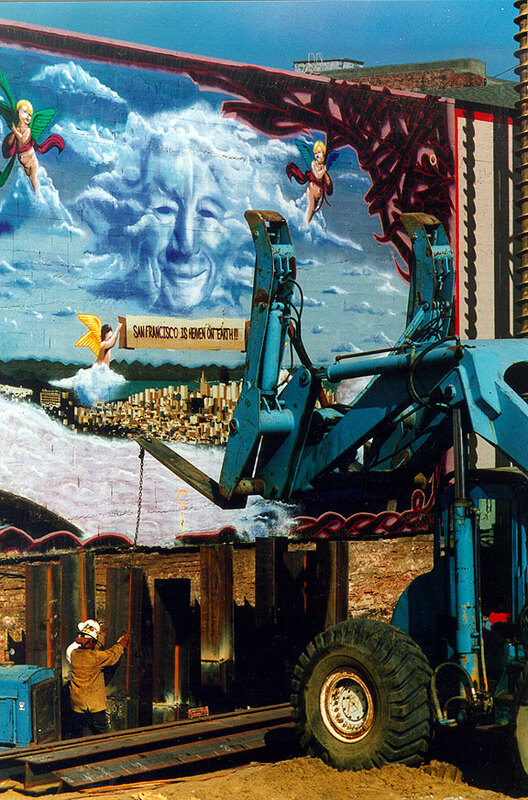 This mural of a beatific Herb Caen face in a cloud floating over the City was painted in the late 1990s on the side of a tire shop on Mission Street between 6th and 7th Streets. As these photos were taken, the new condominiums were beginning to be built in the empty lot next door. 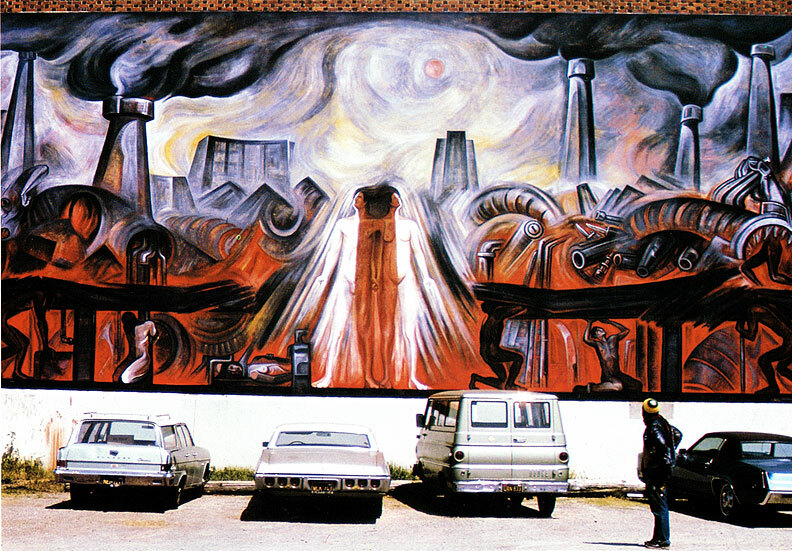 This mural was painted in 1975 by Gilberto Ramirez at 26th and Folsom. 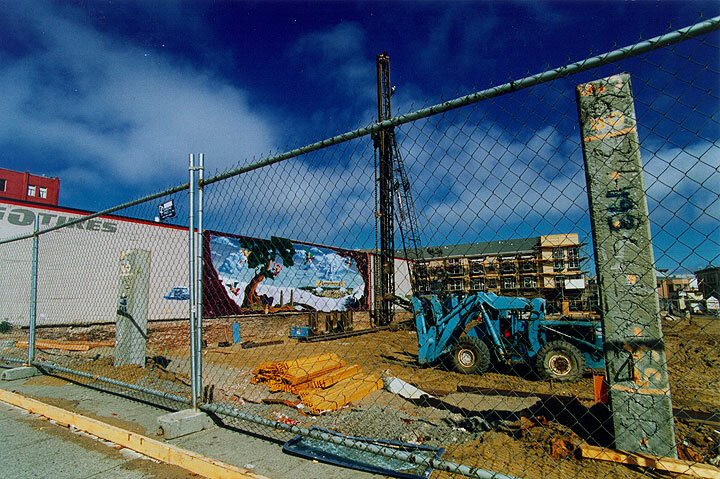 The building was later torn down and replaced by a multi-unit, low-income apartment building that fills the block between 26th and Cesar Chavez along Folsom. Deconstruction of the building destroys the mural. Old Bernal Dwellings projects visible in background east of Folsom Street. 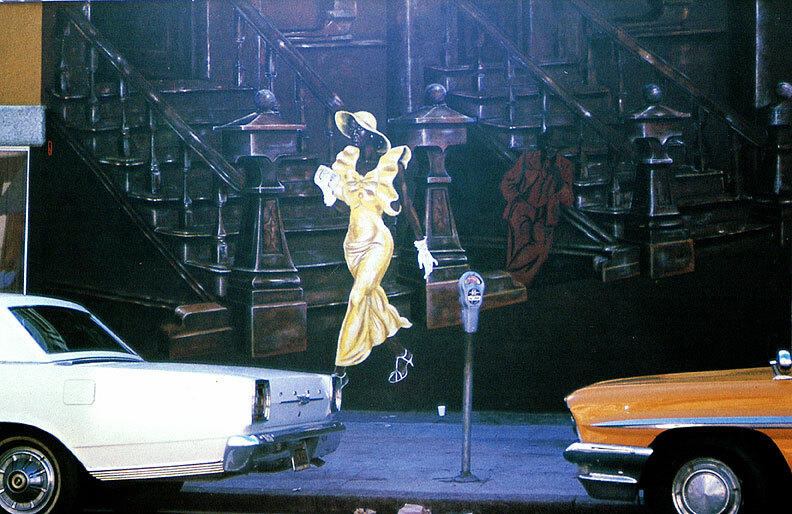 Street scene by Clarkston Peadee, 1975, at Hayes and Divisadero Streets. Latinoamerica, 1974, by Mujeres Muralistas, on laundromat on Mission south of 25th Street. 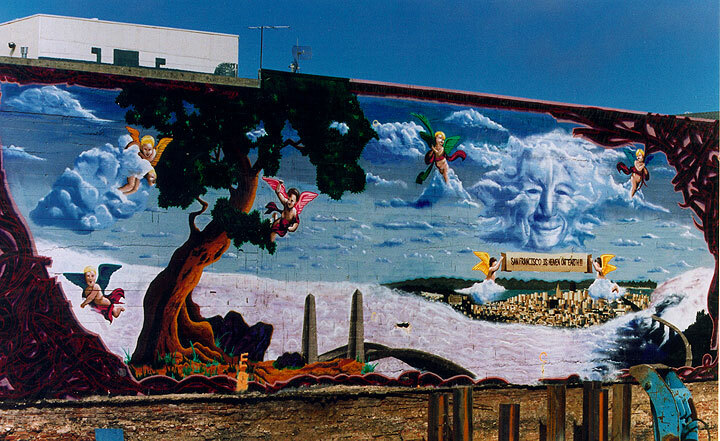 Our History is No Mystery, 1976, Masonic at Hayes, by Haight Ashbury Muralists.